How did Yamuna Sangarasivam get a chance to dance with Michael Jackson in his iconic "Black or White" video — which premiered in 27 countries to an audience of 500 million? Although she was a huge fan of the King of Pop, she never imagined that she would meet him, let alone dance a duet with him in one of his music videos! She heard of Jackson's call for ethnic and modern dancers and auditioned — along with more than 3,000 others — because the amazing opportunity blended her passions for the anthropology of music and the anthropology of dance with her expertise in Odissi dance (classical dance tradition of Orissa, India). When she got the call that she'd been chosen, she happily accepted, promised to immediately get an agent, calmly hung up, and "then I just screamed!" Her duet with Jackson was shot on location during an approximately 14-hour session that shut down a Los Angeles expressway to film them dancing with stunt drivers whizzing through the foreground and background. This was 1991, when she was pursuing her master's degree in the anthropology of dance at University of California at Los Angeles. It was also the era of Los Angeles race riots and the brutal beating of Rodney King — an unarmed black man — by four white Los Angeles police officers. Jackson's video was and continues to be a call to celebrate multiple cultures, while confronting and addressing the history of racism. 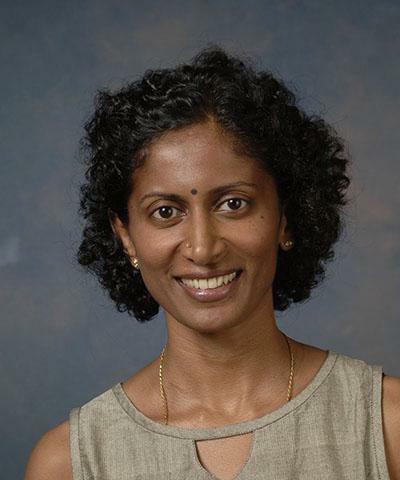 Sangarasivam has presented an analysis of the video at musicology and performance studies conferences, and continues to connect its themes, such as diversity, cultural integrity, and transnational formations, into her work today. Sangarasivam dances with Jackson from 3:27 to 3:47 in the “Black and White” video. Teaching identity and culture hits close to home for Sangarasivam. Growing up in northern Sri Lanka, Yamuna studied western classical piano, Tamil carnatic voice, and Bharatanatyam (Indian classical dance tradition of Tamil Nadu). With her father hailing from Singapore and her mother from Kuala Lumpur, Malaysia, Sangarasivam learned three languages and lived in Sri Lanka and North Borneo before emigrating with her family to the United States when she was 9. This, Sangarasivam says, created within her "a very strong transnational identity while growing up in a multicultural context." "Anthropology, principally, is the study of multiple and diverse cultural ways of being and ways of knowing," Sangarasivam says. As technology advances and the world becomes more globally connected, it is impossible to predict what the jobs of tomorrow might look like. "What we do know," she says, "is that people from different countries, speaking multiple languages, and with transnational identities are going to be working closer together. To be successful, one must learn to live and work cooperatively and collaboratively, and to create and produce knowledge in multicultural contexts. Anthropology prepares you to do exactly that." "I knew that I wanted to work very closely with students, which is why I chose to work within a small liberal arts context — because I believe that's where the critical work of pedagogy happens." "I'm going to ask you to think about all the assumptions you have, your greatest values even, and to encounter an entirely new way of thinking that will allow you to discover something beautiful in yourself," says Sangarasivam. "You will gain the confidence to work with so many different kinds of people... in our increasingly globalizing world. "You will have the opportunity to learn whole new ways of seeing the world, of thinking about what it means to be in the world." Anthropology — the study of human societies and cultures and their development — offers a lens on today's debates about privacy, digital surveillance, democracy, and people's sense of self. "We're living in an age where social media becomes a central part to the identity of young people now. A student's sense of worth and value is becoming increasingly connected to how many people follow them on Instagram or Twitter or the number of Facebook friends they are able to acquire. How students know themselves and how they exist in the world is now being disciplined by technology." "To young scholars, I endeavor to teach that education is a practice of liberation. Education invites us to learn how to be conscious and conscientious citizens. This is not just about core curriculum requirements, what major you are, what profession you're going into and how much money you will make. It is equally important that we continue to forge a society that is just, compassionate, and honoring of all living beings," says Sangarasivam. "The thing that fulfills me most in my career has been being able to honor my parents," Sangarasivam says. "They gave me so much in terms of educational opportunities and sacrificed so much so that I and my siblings excelled in our education. Education was first and foremost a principle value, not only for our family but for the Tamil communities of Sri Lanka." To this day, Sangarasivam considers her mother her "academic advisor" who guided her toward excellence, and who attended Sangarasivam's conference presentations, read her writings, and even attended class a few times. "From day one, you will be held accountable to your word, to deadlines, to a higher standard. It is not rare for students to struggle as they come to terms with such an engaged approach to learning, communicating and facilitating. Of course, Professor Sangarasivam maintains a healthy classroom culture through the frequent sharing of hilarious and insightful anecdotes, field trips and even spontaneous yoga sessions. (I had the sore thighs to prove it.) She is unflinchingly professional, tirelessly engaged, and kind. In retrospect, the time that I shared with Professor Sangarasivam has shaped me into the person I am today. I never imagined academia would be so challenging. Professor Sangarasivam was at once my greatest critic and my greatest supporter. Because of her commitment to my success, I realized how rewarding a challenge could be." At first, Sangarasivam almost didn't audition, until her mother suggested the project was a perfect opportunity for her to practice ethnography. Michael Jackson "was so gracious, so humble, so kind," says Sangarasivam. Working with him was "extraordinary." Jackson sent a Mercedes to pick up Sangarasivam and her mother, and he went out of his way to bring a warm blanket to her mother while they were working on the outdoor scene. LGBTQ+ Education and Advocacy Award 2018, for having a positive impact on the lesbian, gay, bisexual, transgender, and queer community on campus through commitment to diversity of sexuality, gender identity, expression, orientation, and gender presentation by her actions, and by providing educational programs, creating safe spaces, allyship, as well as supporting and promoting policies that center on LGBTQ+ matters. Sangarasivam directs the Women and Gender Studies Program at Nazareth.